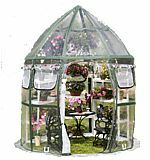 Portable greenhouses are a great inexpensive option for getting a head start in early spring and/or a few extra growing weeks in late fall and/or overwintering plants. they are easy to install and lightweight, yet sturdy for plant protection, and simple to place where needed to take advantage of shade or sun and in a range of sizes to meet any space requirements. You can place a portable greenhouse kit almost anywhere as long as the surface is level and the best thing is that it only need a dirt foundation. Choose from 15 different models of portable greenhouses from 2' x 2' to over 13' in diameter. They provide you with an inexpensive way to get a jump-start on growing in the spring and extend it longer into the fall. 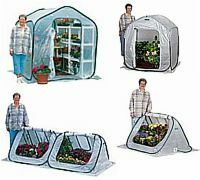 FlowerHouse portable greenhouse kits are compact and lightweight for easy transport, setup, and take down. These mini greenhouse kits require no tools for assembly and can easily be built in 30 minutes or less. They can also be taken down just as easily and stored in a garage, basement, or even a closet. All of the windows have built-in screens to keep out animals and insects out of the greenhouses.